We are coming to the end of our first week in the Orkney Isles and whilst a lot of things have stood out as great, the one thing has been surprisingly outstanding has been the food served to both staff and patients. The majority of my medical school clinical work has been done in the Southern District Health Board (SDHB) hospitals. One only needs to Google ‘food’ and ‘Dunedin Hospital’ to see the hotbed of controversy which hospital food has generated in the SDHB region. Amazingly for a period this year it seemed that the Otago Daily Times could generate half its news items from opinions gathered from staff, patients, and politicians about the source, quality, and taste of the food served in the SDHB. I never really ate frequently in the hospital cafeteria due to the exorbitant cost to quality ratio it delivered versus the vast number of food options in close proximity to the hospital. But I certainly saw a lot of patient meals go uneaten or partially eaten in the wards that didn’t look overly appetising. 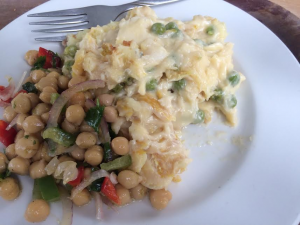 Thus when we arrived at Balfour hospital and the first thing we were told was make sure you are hungry on a Friday morning for the big breakfast served by the cafeteria, I was intrigued as to how this hospital sourced and prepared its food. Over the 20 inhabited Islands that make up the Orkneys the total population is around 20,000 people. Kirkwall, where we are based currently has a population of 7500. Whilst this is no thriving metropolis like the mighty Invercargill where I grew up, it isn’t exactly a small town, and interestingly there are very few if any multinational companies in the village. There is a Tesco’s, but no McDonalds, no KFC, no Subway, no Warehouse equivalent. It appears as though everything is locally owned. The hospital cafeteria is no exception to the paucity of ‘economies of scale’ businesses that are so prevalent within NZ. The hospital cafeteria it turns out makes everything from scratch themselves and all items that can be are sourced locally. 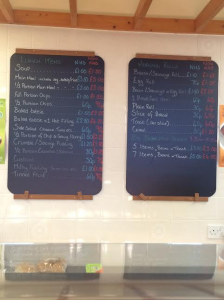 The same meals served to staff are served to patients and I have taken a few pictures this week to show how good it is. The meals Anna and I have been getting usually work out to be around $8-$10 NZD between us. My personal favourites so far have been the locally caught fish pie and the haggis & mince lasagne, but we are yet to experience the Friday big breakfast…. The staff and the patients here are really proud of the food that is produced in the hospital and support the cafeteria really well. It is a nice change. I can absolutely see why people are outraged that the SDHB has outsourced its meals services to a company that sends them frozen from Auckland. Whilst some savings may be made, there is an inherent sense of pride and morale that is lost when the local economy and producers aren’t utilised. This can’t be measured the same way money is. Great comment Jono….keep it up! Can’t understand NZ policy re: food in hospitals when we all understand that fresh is best and so obviously vital to good healthcare ….